An article of interest regarding animal abuse appeared in the NY Times on Monday, 2/22/10, Page A10. The article by Jesse McKinley indicates that California is considering a law listing animal abusers in an online registry, complete with their home addresses and places of employment. The bill was introduced Friday by the State Senate's majority leader, Dean Florez. The law would be the first of its kind in the country and is just the latest law geared toward animal rights. Under Florez's bill, any person convicted of a felony involving animal cruelty would have to register with the police and provide a range of personal information and a current photograph. That info would be posted online, along with info on the person's offense. An Assistant Attorney in the Commonwealth of VA , is a supporter of the bill saying such a registry could also be valuable in tracking people who run puppy mills and animal-fighting rings as well as hoarders who collect hundreds of animals resulting in neglect. 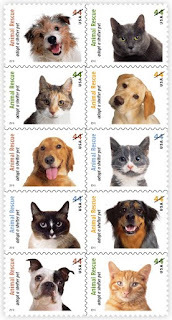 The bill is also endorsed by the US Humane Society. Write California's State Legislature in support of this bill and write your state representatives acquainting them with the proposed law and asking for consideration in your state. 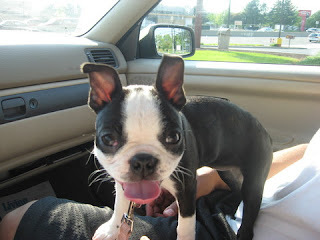 It's little Penny's 2nd birthday !!!!!! Shes my little diva. Tons of attitude in a 15 lb little body! She knows shes cute and can get whatever she wants! 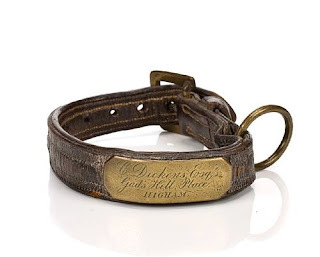 A leather and brass collar belonging to one of the greatest writers of the 19th century has sold at auction for $11,599. That is one sturdy and very cool dog collar. You can imagine Dickens’ hands buckling it around his dog’s neck. Being that the collar is 23 inches, it probably wasn’t for one of his smaller dogs. Dickens’ Pomeranian, Mrs. Bouncer, was not likely the wearer. 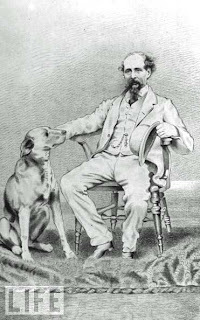 And there’s a bit of dog-based literary history for your reading pleasure! 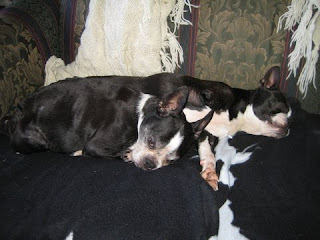 John and Rebecca Brewster adopted bonded foster pair Lady and Buster in July of 2009. Since that time, their foster family the Thelins have kept in touch with the Brewsters. They were all able to get together at the Canine Learning Experience in Allentown PA last month. It was great for Alexandra and Ellen to see and hug Lady and Buster again, and it was clear that they were thriving with all the love given them to the Brewsters. 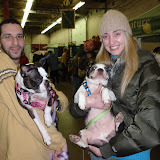 What a wonderful ending for these pups who had been looking for their furever home! They certainly have hit the doggy powerball lottery! Ori (short for Oreals) is an almost 4 year old puppy mill girl which means she's done nothing but push out puppies her entire life. 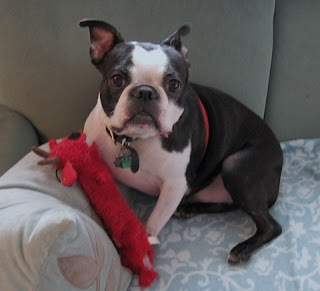 The miller was afraid she would get fined for having a dog with 3 legs and needed her out ASAP which is where Sparky's Project and NEBTR stepped in. It doesn't slow her down very much. She supposedly injured it in a dog fight and it was amputated as a result. She was placed with the Rowe family, which consists of Vicki, Nick and Molly, who was also rescued by the NEBTR and loved by the Rowes. 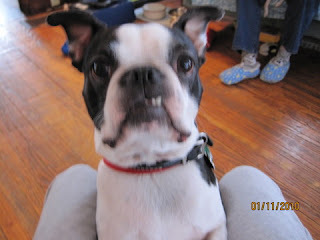 They previously had a heart dog, Tinker, who is watching and smiling down from the rainbow bridge. 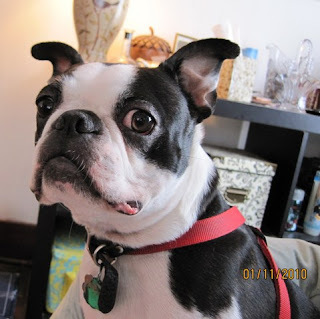 Vicki was her foster mom, and she recently wrote that Ori now has the perfect furever home. 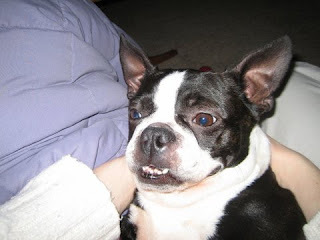 Ori's home, where she is well loved and well cared for, "..is here with Nick, Molly and me! The Mill mama with 3 legs that was supposed to be transported to Ellie in January, never left our house as we couldn't bear to part with her... Something about her captured our hearts and she is finally home. We officially signed adoption papers on Feb 14th--Ori (and Moo!) will be loved for the rest of their lives here with us!! It's been a little over 4 months since Tinker crossed the rainbow bridge and while a day doesn't go by that I don't think of her or miss her, it has been healing having Ori here with us. Molly and Ori a great little pair and we are so blessed to have them as a part of our family! I've attached a few pics of Ori and then a pic of the 2 girls snuggling together...a little slice of heaven on earth! We do love our girls. And we really love and appreciate all the members of NEBTR too! What wonderful news! Congratulations to the whole family! You can read more about their adventures at And Tinker Makes Three. I just wanted to share the success of my first foster for NEBTR. DJ was surrendered by a truly loving family because he had some aggression issues – with both people and other dogs. The reason they finally made the hard decision to relinquish him (after working with a trainer for months) was the escalating fights with their other Boston, who picked on DJ. DJ ended up with an eye injury from a fight and they were just afraid one of the dogs would get seriously hurt. Anyway, he's a great dog – just a loving little sweetheart once he gets to know you. He did have dog aggression issues with a couple of my dogs, so NEBtR helped me work with him and then helped find him a home as an only pet. He is THRIVING! His adopter, Susannah, who is a law student in NYC, fell instantly in love and it seems to be mutual. She loves what a sweet, snuggly boy DJ is. Since he's been with her, he has had zero aggression issues. He is living in the East Village and made the transition to city dog with no problem. He goes to the dog park under close supervision and does well – though he mostly likes to sit on Susannah's lap and observe. He loves long walks through Susannah's neighborhood and Susannah is working with a trainer to ensure DJ continues to make progress. I have been able to pass along some updates to his original family. They really miss him but realize this was the right thing to do for DJ and are so grateful to NEBtR for helping them and DJ. He is so happy in his new home! I wanted to thank everyone at NEBtR who helped DJ along the way! 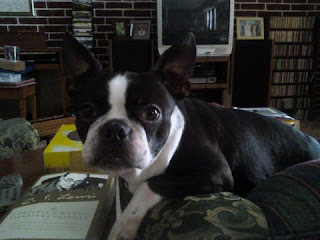 I posted a couple of photos under a photo album named "DJ" so you can see what a handsome boy he is!